The wood Sling Chair is a fundamental take on camping furniture, while the sling includes a padded headrest for comfort and is made of heavy denier polyester fabric. You’ll find the Sling Chair indeed blends the tone of a sculptural sling with the firmness of an articulated wooden frame. The chair frame is a fundamental take on campaign furniture, while the sling is in a complex and comfortable form. 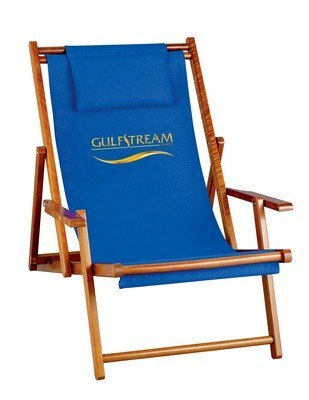 The chair comes with a padded headrest for comfort and made of heavy denier polyester fabric with a brown wood stain. It’s a great promotional idea where your Brand gets all the attention you desire and great for the Beverage Industry, as well as Hotels.